Implants in Our Teeth Now?????? Thanks to Leanne for this interesting confirmation that surveillance has taken on new plights….now it is in our teeth!!!!!!!!!!-A.M. One of the strangest things happened to sixty-seven year Wally Hanson, a retired police officer from Albany, New York. While visiting his dentist for a yearly check-up, a mystifying metallic object was discovered in his tooth. According to Mr. Hanson, he has no idea how the mysterious implant arrived and his dentist, Dr. Fred Wallington, said that Hanson’s X-ray a year ago, came up clean. 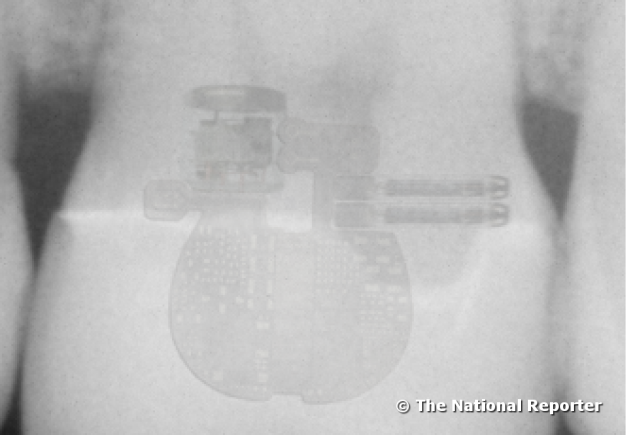 There were no scares, rips, or tears, suggesting that the device was implanted; it just appeared there. Mr. Hanson immediately contacted the FBI, who was interested in its findings. He was then flown into Washington DC to undergo extensive tests. The FBI’s forensic medical investigations concluded that the object in Hanson’s mouth was a transmitter of sorts and that it was not only transmitting frequency signals, but also receiving them. No one, at this point, knows what these frequencies are transmitting. The National Reporter – How often does the implant send out signals? The National Reporter – Do you have any idea who or what put the implant in Mr. Hanson’s tooth? The National Reporter – Do you have any idea’s what the signals are saying? The National Reporter – Have you tried to remove it? No code has been deciphered as of yet and at this point we are left to believe it very well could be alien in nature….